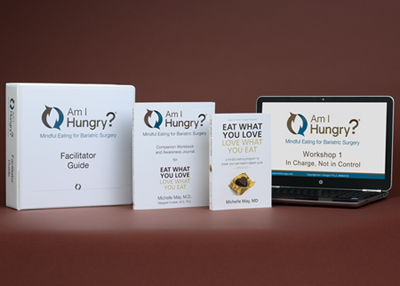 For Health and Wellness Professionals Bariatric Surgery - Am I Hungry?Am I Hungry? How can mindful eating help me? Which mindful eating program is right for me? How can I learn to eat mindfully? How has mindful eating helped other people? How can I help my patients and clients eat mindfully? What have other health professionals said? How can I bring Am I Hungry? to my organization? A Taste of Am I Hungry? 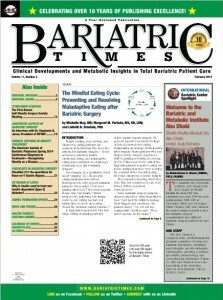 Do you work with bariatric surgery patients? Then you know that bariatric surgery is only a tool. Mindful eating skills help prevent and resolve the mindless habits and emotional eating issues that lead to maladaptive eating and problems after bariatric surgery. Take a sneak peek or order your set here. The challenges posed by a food-abundant environment, social and emotional connections to food, chronic ineffective dieting, and disordered eating may not resolve with bariatric surgery. Offering a structured approach for learning mindful eating skills using the Mindful Eating Cycle may help bariatric surgery patients gain insight into why, when, what, how, and how much they eat and where they invest their energy. The addition of mindful eating skills to the clinicians’ and patients’ toolbox provides conscious decision-making strategies and sustainable lifestyle changes over time. Mindful Eating for Bariatric Surgery: Many people mistakenly believe that their problems with food are caused by what and how much they eat-but that’s only half the story. See how why you’re eating affects every decision that follows. Bariatric Surgery: It’s Still Not About the Food – Mindful eating skills help resolve the mindless habits and emotional eating issues that commonly lead to problems after bariatric surgery. Fill out the form in the sidebar and we’ll deliver these articles right to your inbox. Receive a monthly eye-opening and inspiring article by founder Michelle May, M.D. Subscribe to our complimentary motivational e-newsletter and you’ll also receive “101 Things to Do Besides Eat.” Simply start your monthly subscription or browse through our previous issues here. Am I Hungry? 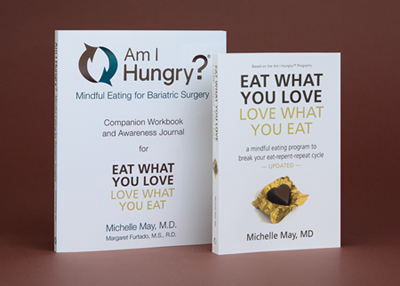 Mindful Eating for Bariatric Surgery Facilitator Training provides you with the skills, tools, and confidence to offer mindful eating workshops or coaching in your bariatric center, office, or community! Subscribe to receive ready-to-reprint-or-post articles and graphics for health and wellness professionals. PowerPoint: What is Mindful Eating? "This way of living and eating is so much more comfortable and less restrictive. This method works because it gives me tools to apply what I already know about eating and exercise. It acknowledges that I am an intelligent woman and makes me feel in charge of my own body and emotions." "I've been to more than my fair share of workshops, seminars, conferences, and retreats but my five days in Carefree was by far the most rewarding experience I've ever had for self-care, self-empowerment, and self-awareness. LOVED IT!!!" "This workshop exceeded my expectations and affected me deeply and personally." "Michelle put the audience of physicians at ease and engaged us in an intriguing discussion about nutrition and health. Her talk was a true masterpiece!" "Excellent opportunity to expand not only your knowledge but also skill sets for meeting your patients' needs. Am I Hungry? offers a genuinely unique and incredibly valuable alternative to ineffective dieting." "This program addresses the real reasons we overeat and gives us tools to overcome them. Most other programs are just surface level. It's a long journey but I have a good start." "Am I Hungry? is a real differentiator for our company. The philosophy of empowering employees to make choices is very different from the programs that focus on what you can and cannot eat." "I was looking for a program that would help me to get out of that never ending diet cycle. Am I Hungry? has truly helped me to take charge of my eating." "This training gave me the tools to share a simple, but radical, concept: We all deserve and can achieve a health-centered, peaceful relationship with food and our bodies." "The Am I Hungry? retreat was absolutely life changing for me. If you are tired of thinking, planning, and reacting to food in the same old way, and want to learn how to live a bigger, beautiful life, this retreat is for you." "Dr. May's program is an effective strategy that can prevent and reverse chronic disease." "The Am I Hungry? program is one of the most comprehensive trainings I've received. It provided me with the tools to get started immediately. I have knowledge, tools, and support to begin working with an individual client or workshop participants. I highly recommend this program." "If you are considering this workshop, take it! It's very powerful. You will learn so much and feel very comfortable in the group." "I loved the modeling of gentle, respectful 'Isn't that interesting?' insights that helped me apply these concepts to my own journey." "Thanks for opening my eyes to a problem I have been fighting with all my life. The concepts I learned from Am I Hungry? have helped me in all areas of my life." "The Mindful Eating for Binge Eating Retreat is masterfully and lovingly created to move you through the process of saying goodbye to bingeing and hello to living!" "Dr. May's mindful eating message resonates with people and provides a refreshing, positive, empowering approach that fits all lifestyles. We look forward to integrating this into the culture here. Her visit created the ripple effect we hoped it would." "This program is precisely what I have been searching for. I highly recommend the training to any professional dedicated to improving the quality of life of their clients. " "If you are tired of food being the center of your life and want to be free to enjoy the rest of your life - this retreat is for you." "Am I Hungry? is by far the most enlightening, thought provoking, forward thinking education about eating. By listening to my body and understanding its needs, I have been able to enjoy eating and exercising without feeling restricted or punished. My whole outlook is brighter!"